Inspired by MyMoneyBlog's post of his Net Worth progress since his College days, I decided to dig out some old quarterly Net Worth figures I had sitting around from the mid '90s and plot them out. I also remember that I had saved approx. $10,000 working part-time during Uni Vacations (which was spent on a telescope and accessories), so I know that my Net Worth when I started working after graduation in '84 was around $10K. The striking thing about this plot is how well an exponential trend line fits the data so far - the R^2 ("goodness of fit") value is 0.9956 (an R^2 value of 1.00 would indicate a perfect fit). 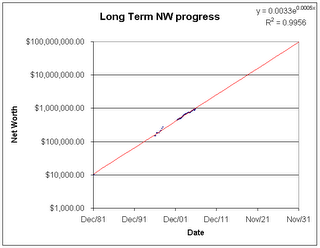 Extrapolating the trend out to age 70 I would end up with around $100m - worth around $48m in today's AU$. I think this overestimates the end result by a factor of 10 or so - a previous model I'd done based on my expected future savings rate and overall ROI (using the expected ROI of each asset class in my portfolio and my planned use of gearing) ended up with around $4m (in today's AU$) at age 65. I think the main reason for the discrepancy is that up to now my overall rate of increase was significantly boosted by my savings. From now on my annual savings will become insignificant compared to the annual return on my existing portfolio. This will happen to most people as their portfolio experiences compound growth, whereas salary cannot keep going up exponentially. This is one reason I think Frank the Financially Savvy Atheist's current plan to achieve his targeted Net Worth ($4.5m in 23 years) still needs more work - an assumption of 8% annual pay rises is OK for a new graduate starting out, but I think salary is unlikely to keep increasing at 7% pa by age 46. I think the long term rate of salary rises later in a career is more likely to be around 4%. Perhaps he has some stats specific to his industry/qualifications that support this assumption.